Sesame oil, which comes from sesame seeds, is one of the lesser known vegetable oils, but is in fact one of the healthiest alternatives to normal vegetable oil options. 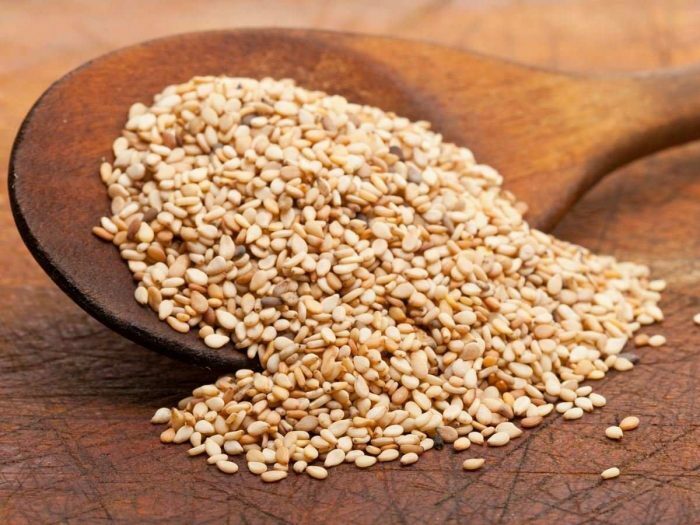 Sesame seeds, which are known by the scientific nameSesamum indicum, are small yellowish brown seeds that are primarily found in Africa, but they also grow in smaller numbers on the Indian subcontinent. Sesame oil has gained quite a bit of popularity in recent years, not only because sesame oil is relatively inexpensive to extract (simple hot water flotation or a variety of pressing techniques). However, sesame oil is best acquired when the seeds are completely ripe, which means that the outer shells burst. Sesame oil can be used in cooking, and it is most commonly used in Asian cuisines, including Chinese, Japanese, and Southeast Asian dishes, as well as Middle Eastern cuisine. Sesame oil has also been used in massage practices, due to its very powerful effects on the body and its beneficial effects on the skin. It has a wide range of health benefits connected to it, which makes sesame oil highly sought after, even as a carrier oil for various cosmetic products. The problem is, the manual processing that sesame seeds require means that there will always be more of a demand than a supply. For that unavoidable reason, global sesame oil production is not as high as other vegetable oils, despite the very healthy aspects. The impressive amount of vitamins, minerals, organic compounds, and other beneficial components in sesame oil is why it is considered so healthy, but let’s take a closer look at what health benefits can actually be enjoyed when you add sesame oil to your diet! Hair Health: Sesame oil has traditionally been used to improve the health of hair. It can help to darken hair color and also eliminate hair loss. Furthermore, the anti-bacterial effects of sesame oil can help to eliminate any of the pathogens or foreign bodies that can attack your scalp or hair. Skin Health: Sesame oil is rich in zinc, which is one of the most important minerals in the body for your skin. It can increase skin elasticity and smoothness, helping to reduce the appearance of age spots and eliminate skin conditions, including premature aging. Sesame oil can also be used as a sunscreen because it creates a protective layer on the skin, which is another way of protecting the body from foreign substances or toxins that get in through the skin. In some cultures, sesame oil has even been used to treat fungal diseases on the skin. Heart Health: Like most vegetable oils, sesame oil is so helpful and delicious in foods because of its fatty acid content. Sesame oil contains a wide range of polyunsaturated fatty acids, including sesamol and sesamin. This can keep the cardiovascular system balanced and keeps cholesterol levels low. It can also drop the cholesterol levels that the body already has, thereby reducing atherosclerosis. This means that you are better protected from heart attacks and strokes if you add sesame oil to your diet. Bone Growth: There are many important minerals that can be found in sesame oil, particularly copper, zinc, and calcium. These three minerals are integral to bone growth in the body, meaning that by maintaining an appropriate level of sesame oil in your diet, you can help increase the rate of bone growth and development, as well as speed up any healing or regrowth of bones as well. As you get older, sesame oil can help you avoid osteoporosis and various other age-related weaknesses of the bones. Anxiety and Depression: Tyrosine is an amino acid that is found in relatively high quantities in sesame oil. Tyrosine has been directly connected to serotonin activity and release in the brain, which can help boost mood by flooding the body with enzymes and hormones that make a person feel happy. In other words, when you are suffering from anxiety or depression, sesame oil can help give you a positive boost in the right direction and turn your mood around! Oral Health: Sesame oil is highly recommended by dental professionals because of a process called oil pulling, which involves putting oil in your mouth and then swishing it around before spitting it out. With sesame oil, this process has been directly linked to whiter teeth, lower levels of dental plaque, and protection against certain streptococcus mutants that can make us very ill. The powerful anti-bacterial effects of this oil are the main cause of this boost in dental health. Prevent Cancer: Sesame oil contains an organic compound called phytate, which has been directly linked to a reduction in the development of cancer. Furthermore, the magnesium levels in sesame oil are unusually high, and that essential mineral is directly linked to lowered chances of colorectal cancer. The calcium content is also very beneficial for preventing colon cancer. Circulation and Metabolism:High copper and zinc contentmean that the body is able to function at its optimal levels, mainly because copper is required for the production of red blood cells. With the significant percent of copper in sesame oil, your body is sure to get the right amount of blood flowing to the organs and tissues, ensuring a healthier and more high-energy lifestyle! Inflammation: Copper is a naturally anti-inflammatory substance, and the high levels of copper found in sesame oil can help to reduce the inflammation and discomfort of various conditions such as gout and arthritis. It reduces the swelling of joints and strengthens the bones and blood vessels, helping to keep your frame strong and sturdy for many years, without that painful inflammation.